The thin wall design of chrome hand sockets are combined with the strength and durability of Grey Pneumatic impact sockets to create the Duo-Socket™. This 59 piece set is built specifically to address the needs of the professional technician using hand tools, cordless impact tools, and air tools. The Duo-Socket™ provides one socket for all applications. 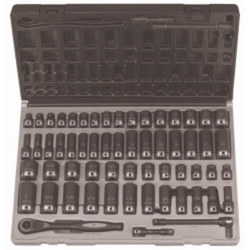 This set includes the following: 72 tooth quick release ratchet, 3" and 6" straight extensions, and the socket sizes include: Standard and Deep Fractional: 5/16", 3/8", 7/16", 1/2", 9/16", 5/8", 11/16", 3/4", 13/16", 7/8", 15/16", 1"; Standard and Deep Metric: 7mm, 8mm, 9mm, 10mm, 11mm, 12mm, 13mm, 14mm, 15mm, 16mm, 17mm, 18mm, 19mm, 20mm, 21mm, 22mm.